When Canadians contemplate an accident that may result a serious injury, what usually comes to mind are motor vehicle collisions or recreational mishaps such as skiing accidents. However, slip, trip and fall accidents are one of the leading causes of accidental injury in Ontario, on par with motor vehicle collisions. Although senior adults are often more severely injured when they fall, people of every age succumb to these types of incidents. Unsafe circumstances or hazards causing a slip, trip and fall accident are sometimes the result of property owner negligence. The slip, trip and fall lawyers at Injury Lawyers of Ontario are specialists in negligence law pertaining to slip, trip and fall accidents and can advise you on your options if you or a family member sustained a serious injury in a fall on an unsafe property. In Ontario, slip, trip and fall accidents can happen in any season. In the winter, the most common cause is icy or snowy walkways and sidewalks. In the summer, falls can result from a variety of unsafe conditions, particularly from wet surfaces or spills, debris and uneven walking surfaces. Tens of thousands of Canadians commonly fall and miss work every year as a result of these incidents. Some of these accidents occur in the workplace, but many slip, trip and fall accidents happen to Canadians during personal activities such as shopping, commuting, walking for enjoyment, and doing chores in the home. Slip, trip and fall accidents often result because a property was unsafe in some way. In Ontario, the person who owns or occupies a property is responsible for keeping their property reasonably safe for anyone who might come onto the premises. If a property owner/occupier does not take due care for people’s safety, as defined in the Occupiers’ Liability Act, and someone is injured as a result of these unsafe conditions, then the owner/occupier can be found negligent. Anyone who has control over a property and its use, including owners, tenants or managers of activities on the property, is considered to be an ‘occupier’ of the property. Also, if there are temporary unsafe circumstances on a property, such as areas under repair, these must be clearly identified so that visitors are properly warned of the hazard. Slips typically result from poor traction. The following are common causes of a slip and fall. Trips happen when a person loses their balance after their foot hits an object. Common causes of trip and fall accidents are as follows. There are two types of falls: those on the same level, and those that involve falling from a height. About 70 per cent of falls occur on the same level of walking surface. Uneven or slippery surfaces, tripping hazards, poorly lit pathways and unsuitable footwear are the primary factors in falls that occur on the same level. When individuals fall from an elevation, ladders, roofs and stairways are the primary source of injury. When anyone slips on surface that doesn’t provide enough traction, they typically fall backwards. The points of impact in this type of fall are usually the buttocks, back and sometimes the head. In contrast, when we trip, we almost always fall forward and try to break our fall with our hands. The following are injuries that may result from falling due to slips or trips. The kind and severity of injuries that a person may sustain when they fall differs with the circumstances surrounding the event (such as the hardness of the surface) as well as personal characteristics (such as their health). Seniors are more likely to sustain broken bones in a fall than a younger person, as well as injuries to the face if they are unable to put their hands out in time when they trip. We can do much to reduce the risk of falling on our own properties or in our business environment. A key way to prevent these accidents is by practicing good housekeeping, by cleaning up spills, debris and other materials in a timely manner, and by installing flooring that offers good traction. Also, by wearing appropriate footwear, we are less likely to fall under any circumstances. The following are important ways to prevent slips, trips and falls, that apply in home, work and business environments. When can properties owners be deemed liable for unsafe conditions? When a judge considers a claim for damages for injuries that resulted from an unsafe circumstance, there are specific practices that are typically assessed. Property owners who fail to take reasonable care to perform the following practices are likely to be found liable if someone is hurt on their property. Have a regular procedure for inspecting the property, and following through with systematic inspections. Have a set procedure for maintenance, and follow through with repairs in a timely manner. Clearly mark and warn of any dangerous situations. Slip, trip and fall accidents can occur when occupiers/owners of a property did not take reasonable precautions to keep people safe from injury. At the same time, there is an expectation that anyone using the property will also take reasonable care for their personal safety. When the courts assess who was at fault in a slip, trip and fall claim, they may determine that the owner/occupier was liable for all of the damages to the injured person, not at all liable, or as is sometimes the case, it may be concluded that the fault is shared between the owner and person who was injured. In the trial, Miller v. Her Majesty the Queen in Right of Canada, 2015, a man sued the Canadian government after he slipped and fell while incarcerated at “Pittsburgh Institution” which is a correctional facility in Ontario. The man suffered a serious injury when he slipped on an icy walkway, which was actually his second fall under similar conditions at the correctional facility. The trial judge concluded that the facility did not have a reasonable and systematic procedure in place to ensure that users would be kept safe. In particular, the system for maintaining the walkways free of ice and snow where the plaintiff fell, were not regularly inspected and were also haphazard in terms of consistency of snow and ice removal. The plaintiff was perceived to be a credible witness by the judge. His injuries were a source of ongoing pain and are likely to be permanent. At trial, the plaintiff sought damages only for pain and suffering (non-pecuniary damages) and was awarded $100,000. However, the judge found that the man’s inappropriate footwear (i.e. running shoes) at the time of his accident contributed to his fall, so he received $70,000 of the total amount awarded. If you were injured in a slip, trip and fall accident, it is a good idea to seek the advice of a personal injury lawyer as soon as possible. The success of your case depends on precise identification of the circumstances that caused your fall. Evidence such as witness statements, defects in the floor or stairway construction, inspection reports, and photographs are important for your case, but evidence can be more difficult to obtain if you wait until long after the accident occurred. In addition to effectively identifying the owner’s negligence that lead to your injuries, you will need proof of the extent of your injuries, in the form of medical records and receipts, and statements from health care professionals. Victims of slip, trip and fall accidents have the right to seek compensation for the following damages resulting from injuries. Family members can also make claims under the Family Law Act to receive compensation for loss of care, guidance and companionship resulting from the injury to their loved one, as well as other financial losses they incurred. Injury lawyers of Ontario (ILO) are an affiliation of experienced and respected personal injury lawyers in local communities throughout Ontario. Our lawyers have a high degree of expertise in negligence suits (‘tort action’) that achieve justice for individuals seriously injured in a slip, trip and fall. 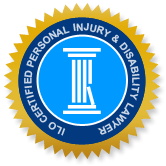 If you or a loved one was hurt and would like to learn about your rights in terms of seeking compensation for your injuries, call an ILO lawyer in your community. You can be assured of an honest assessment of your individual case, which will allow you to make the optimal decision for you and your family.